This is the easiest waterfall hike in the gorge. 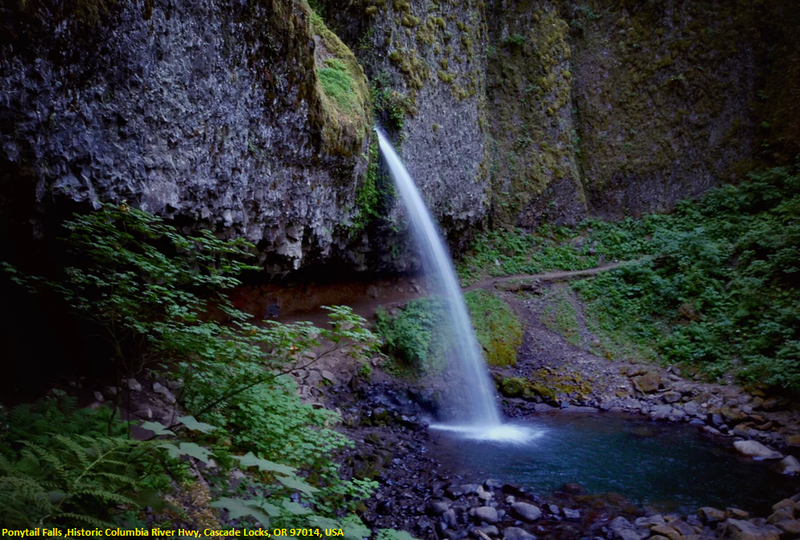 You get a stunning waterfall at the trailhead and a second one less than half a mile up the trail.Coming from the west on I-84, take exit #28/Bridal Veil and drive east on the Historic Columbia River Highway past the Multnomah Falls Lodge and on to the Horsetail Falls parking area. Coming from the east on I-84, take exit 35 (Ainsworth Park) and drive about 3 miles west on the Historic Highway to reach the Horsetail Falls parking area and trailhead. The trail begins in one of the most scenic trailheads anywhere, at Horsetail Falls. Plan on a bit of time before or after you hike to view and photograph the falls. Horsetail Falls Trail #438 begins climbing some easily graded switchbacks with beautiful rock walls. You'll pass your first trail junction here, as Gorge Trail #400 heads east. After 5 switchbacks the trail levels out, and heads west for a bit high above the Gorge below. After 4/10 of a mile, the trail suddenly turns into the small valley containing Ponytail Falls.